LONDON — A means to an end, or an end to memes? Tech leaders and digital rights activists in Europe have expressed dismay over new rules they say could change the open nature of the internet forever — and potentially kill meme culture. They have been fighting against Article 13 of the proposed E.U. Copyright Directive, which would place responsibility for enforcing copyright law on websites and platforms, rather than individuals. It would mean that any website or platform that allows users to post images, footage, sound or code would have to use content recognition technologies — branded "censorship machines" by critics — to filter out just about anything that infringes on a copyright, and either prevent the platform from uploading or push it to seek licenses. These algorithms could mean that even internet meme culture, in which people use common images to create running jokes, could be unintentionally scuttled. “I think without a doubt there will be a threat to the way people use memes,” Jim Killock, the executive director of the Open Rights Group, a London-based organization that supports freedom online, told NBC News. “They are clearly reusing copyrighted material, mostly legitimately, but it’s very hard for a machine to know that." Lawmakers on the European Parliament Committee on Legal Affairs voted in favor of the legislation in the directive — most of the rest of which simply updates copyright law — on Thursday morning. The legislation is primarily intended to prevent online piracy in music and video. However, in addition to memes, it could affect live-streaming, code sharing, and sampling and remixes in music, as well as satire, parody and protest videos. And Article 13 isn’t the only part of the legislation causing fierce debate. Article 11 has been dubbed the Publishers' Neighboring Right, and could force Google, Microsoft and other platforms to pay publishers for showing news snippets, or linking to news content in what has been dubbed a “link tax” by opponents, and a further threat to an open internet. News publishers, however, have welcomed this particular part of the legislation. “The internet is only as useful as the content that populates it,” said Carlo Perrone, the group’s president. “This Publishers' Neighboring Right will be key to encouraging further investment in professional, diverse, fact-checked content for the enrichment and enjoyment of everyone, everywhere," he said. The committee’s ruling will probably be the parliament's official stance as it enters into negotiations with E.U. countries on a common position. However, dissenting lawmakers could still force a parliamentary vote at a general assembly next month. Campaigners against the legislation are therefore turning their attention to members of the European Parliament to make that happen. Memes could be affected by Article 13 as they invariably feature stills, gifs and clips that are taken from movies, TV, music videos, professional photography and social media posts. The copyright for this source material usually lies with someone else, although whether copyright is actually being infringed in a meme is a murky legal question, as it could be allowed under fair use or parody laws. “Until computers develop humanlike intelligence and are able to interact on machine level with human culture to make human cultural judgments, it’s unlikely that computers are going to be able to make these judgments accurately at all,” Killock said. How to enforce laws surrounding content on the internet is an age-old debate in tech. The developments around Article 13 are yet another sign that responsibility is increasingly falling upon platforms, with the responsibility shifting from those who upload legally questionable content to those who host it. 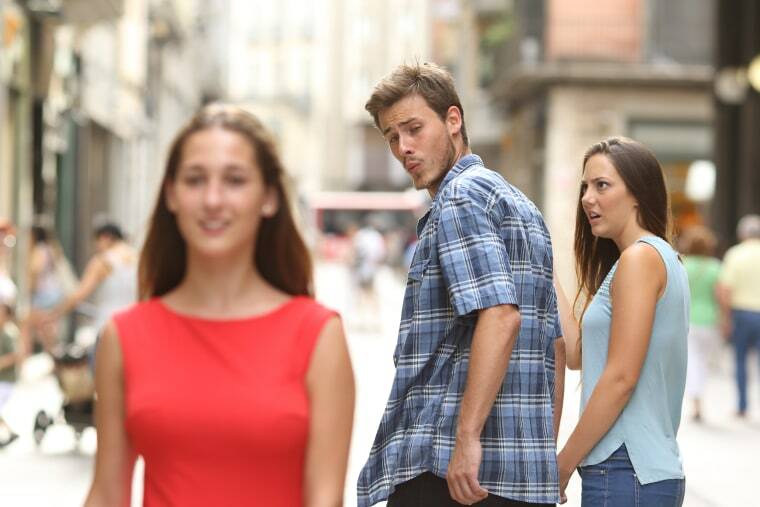 One such meme that may have fallen afoul of the legislation is the jealous girlfriend meme, which became near-ubiquitous on social media last year. The image was originally taken by Barcelona-based photographer Antonio Guillem and placed in stock image libraries. Guillem owns the copyright for that particular image, but most of those who uploaded their own versions on social platforms wouldn’t have paid the image library a fee when they did so. If the proposed EU directive were to come into force, content recognition technology could be expected to prevent a meme using Guillem’s photograph from being uploaded to social media without his or the image library’s permission, or directed the user to seek proper licensing. “Of course, they’re not entitled to pay them under copyright law, but because these tools are so blunt, they might well be able to push for payment,” he added. Last week, 70 influential tech luminaries — including World Wide Web inventor Tim Berners-Lee and Wikipedia founder Jimmy Wales — signed an open letter to the European Parliament’s president describing Article 13 as an “imminent threat to the future” of the internet. Following the committee’s ruling, the lobbying group CCIA, whose members include Google, Facebook, eBay, Amazon and Netflix, criticized lawmakers for ignoring the letter. Maud Sacquet, a senior manager with CCIA, in a statement urged members of the European Parliament "to contest this report and to support balanced copyright rules, which respect online rights and support Europe’s digital economy." And although the legislation will only directly affect internet users in the European Union, Open Rights Group’s Killock said there could be secondary effects for people everywhere. “If you’ve identified this material and deleted it for European users, why should it be presented for U.S. users?" he said. "Clearly if something is identified as infringement and it belongs to a U.S. user, should it be publishable in Europe?" The legislation does have its supporters, however. The Brussels-based Independent Music Companies Association said the committee’s ruling would address issues surrounding licensing that have created a “value gap” in the music industry for years. “This is a strong and unambiguous message sent by the European Parliament," Helen Smith, the association’s executive chairwoman, said in a statement. "It clarifies what the music sector has been saying for years: If you are in the business of distributing music or other creative works, you need a license, clear and simple. It's time for the digital market to catch up with progress."